Some few decades ago, vinyl music was the most popular form of recording and playing music. Vinyl music was later replaced by tapes, compact discs, and now digital music. Today, there’s an increasing interest among many people on investing in vinyl music. This kind of music recording is played on turntables. Turntables are making a major comeback around many homes, parties, and events. They offer a unique and great sound experience. To maximize the benefits of your turntable, you need to choose the best sound setup, especially if you’re an audiophile. One of the best setup options is using passive speakers. 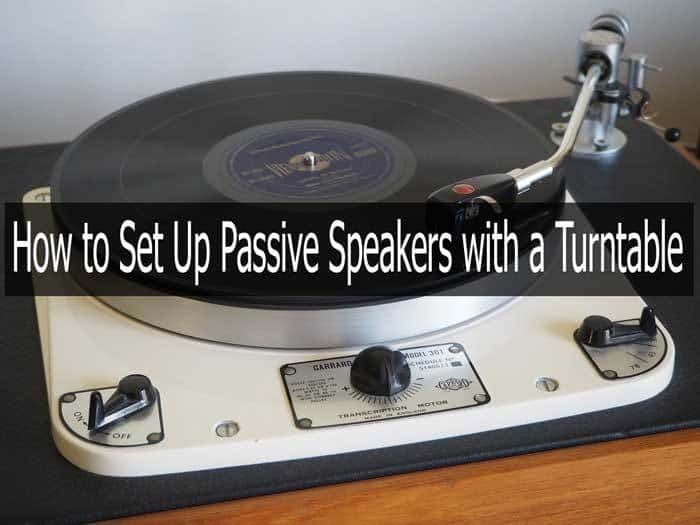 Basically, passive speakers are great for connecting turntables because they allow you to easily add multiple speakers to an amplifier and even add sound reproduction equipment for the best effects. You can also use different amps with different passive speakers. It’s also easier to upgrade a passive speaker set up since you can easily add any sound equipment you want. However, with an active speaker, you have to accept it the way it is since upgrading it means replacing the entire active speaker unit. While an active speaker set up will be technically easier to set up than a passive option, you’ll be limited whenever you want to add more sound equipment. Thus, passive set ups are greater for turntables. Setting up a turntable can be a very simple process when you know what you’re doing and what you need. There’re several things you should know before investing in the necessary sound equipment. Luckily, this guide will enlighten you on everything you need to know. Turntable- Basically, a turntable plays vinyl music recordings. It creates an audio signal that is transmitted to a stereo system. If you don’t have one already, you’ll need to buy it. These music units operate either with a belt-drive or a direct-drive operation mechanism. You’ll have the freedom to choose between a vintage (used) and a new turntable. A vintage unit might be ideal in bringing out old memories and affordable if you’re going to get it from a relative or friend who no longer uses it. However, a vintage unit might be a bit unpredictable in terms of specifications and maintenance. Modern and new units are more reliable, especially if you can get a high-quality model. Passive speakers- Passive speakers are speakers that don’t have their own source of power. They are usually powered by an external amplifier. The number of passive speakers you’ll use will depend on the kind of sound you want, your budget, and size of the room. In case you’ll desire to use more speakers, you’ll surely want to add a more powerful amplifier to ensure they receive enough power depending on their power rating. Preamp- When setting up a turntable, you’ll need to invest in a preamp. A preamp is usually installed between a device producing sound signals and an amplifier. Basically, the role of a preamp, in this context, is strengthening the weak electric signal that a turntable produces. The preamp outputs a stronger signal that is strong enough for more processing by an amplifier. It also makes the signal strong enough to tolerate noise. When using a turntable, you’ll specifically use a phono preamp. Phono preamps are specially designed to work with turntables. Besides strengthening the signal, this type of a preamp also equalizes the signal to revert it back to the original recording. Amplifier-Besides a preamp, you’ll also need to use an amp. An amp will amplify audio signals from the phono preamplifier and power the passive speakers. For the best sound, you’ll need a standalone amp. Preferably, choose a power amp with input level controls. This will assist in adjusting the volume level. Receiver- You can use a receiver to process the sound coming from the turntable and connect the receiver directly to the speakers. This will eliminate the need to use a separate preamp and amp. Consider a receiver that has phono inputs to eliminate the need to use a preamp. Basically, the role of a receiver is processing and strengthening a weak turntable signal to make it strong enough to power the amp line in a receiver. Some turntables may require grounding. You can check for the user manual if your unit requires grounding. Alternatively, check for a knob written “GRND”, which means “Ground”. If you find such a knob on your unit, then it requires grounding. Just unscrew the “GRND” knob and wrap a wire on the metallic part of the knob. Tighten the knob to ensure the wire is held in place. Then wrap the other end onto a metallic post connected to the ground earth. The purpose of grounding is to eliminate hum through the speakers. Basically, this works by preventing low-frequency hum from your turntable from having any interference with the audio..
Phono preamps are connected to turntables to strengthen the sound signal for further processing and amplification through an amp. Here, you’ll need standard RCA cables to connect your vintage music player to the preamp. Connect the cable on the right and left output channels on the turntable and connect the other end to the input ports on the preamp. Next, connect the preamplifier output to the line level inputs on your amp. Again, you’ll need an RCA cable with a right and left channel to do this. Ensure you are connecting the cable to the right inputs, otherwise you might lack sound. Next, connect the power amp to your passive speakers. First, you would want to know where you’ll position the speakers in the room. This will assist in determining the length of speaker cabling you’ll need. Once you have determined the best location, run enough length of a speaker wire from the amp to the speakers. You can allow for some extra feet of wire for accommodating minor speaker changes you would make in future. Then connect the cable on the output audio ports on the amp and connect the other end to the input ports on the speakers. Now that you’ve made the necessary connections, it’s time to test the set up. Simply turn everything on. Then load your favorite vinyl recording on your turntable and start enjoying your music. Adjust the volume accordingly on the power amp. If your amp has more equalization settings, make use of them until you get the best sound level. In case you fail to get sound, probably you’ve not connected a certain unit properly. If this is the case, try connecting the RCA cables to different ports until you get sound. First, connect the turntable audio output to the receiver phono input. The receiver will boost the signal of the turntable to be strong enough to drive the amp level input. A receiver comes with an inbuilt preamp that strengthens the signal of the turntable to a useful level. If your receiver does not have a phono input, you can use a phono preamp between your turntable and the receiver.Also, remember to ground the turntable to eliminate hum. Next, connect your receiver to the passive speakers. Simply connect an RCA cable to the audio output port on receiver. Then connect the other end to the passive speaker input. Once you’re done connecting the turntable to the receiver, and the receiver to the passive speakers, you’ll need to turn on the units. Play your favorite vinyl recording. Adjust sound settings on your receiver to your liking. In case you fail to hear any sound, check the connections or try other ports until you get the set up working. Although turntables are considered to be vintage music player units, you can still bring them back to life and enjoy music recordings from the good old days. By investing in the right passive speakers, a preamp and an amp, you can surely benefit a lot from your turntable. You can even use it to play music during a party and surprise your friends. Thus, don’t let that vintage unit continue gathering dust in your store. Put it into good use and if you don’t have one, you can easily buy a new one to remind you where music has come from.